The capital city of Magadan oblast. Magadan is a city and seaport on the coast of the Sea of Okhotsk, located in the northeastern part of Russia, in the Far East. It is the capital of the Magadan oblast and the Kolyma region gateway. The population of Magadan is about 93,000 (2015), the area - 295 sq. km. The phone code - +7 4132, the postal code - 685000. Local time in Magadan city is April 19, 1:22 am (+10 UTC). 2 September, 2018 / Magadan - the view from above. 6 December, 2015 / Magadan on a sunny summer day. 8 February, 2010 / Jumping into snow from 5-storey roof video. In the 20th century, the interest of the Russian government to the Okhotsk coast and Chukotka seriously increased in connection with a search for new deposits of precious metals. In 1915, a lone prospector Shafigullin found first gold in the Kolyma region. In 1926, an expedition of S.V. Obruchev discovered favorable geological conditions for the occurrence of this metal. Two years later, the first Kolyma expedition of Yu.A. Bilibin initiated a detailed study of the region. Reliable information about the economy of the region was obtained by a hydrographic expedition of I.F. Molodykh, who recommended the Nagaev Bay as a good place for the construction of the port and the starting point of the road construction. 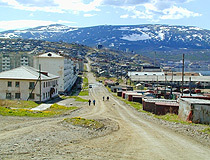 Magadan village was founded in 1929, and became a town in 1939. In November 1931, the State Trust for Industrial and Road Construction in the Area of the Upper Kolyma “Dalstroy” (from 1938 - the General Directorate of Construction of the Far North of the NKVD of the USSR “Dalstroy”) was established. 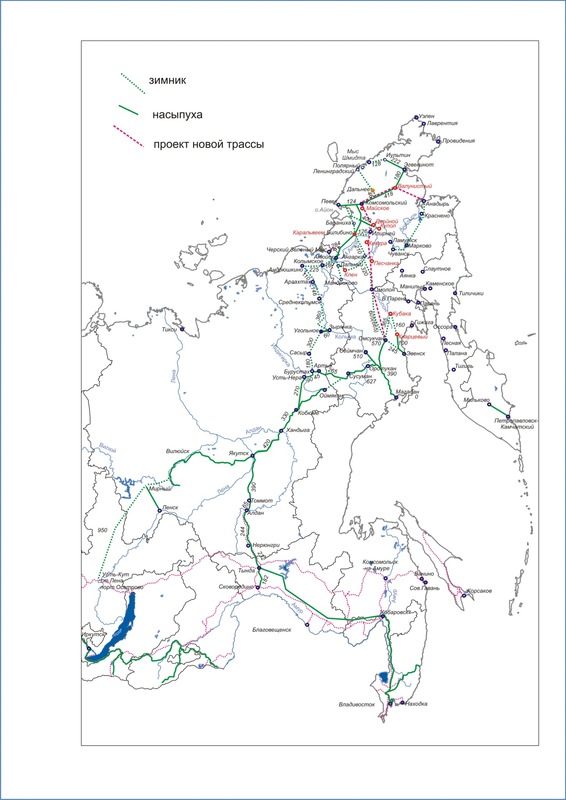 The initial task was to build a road from the coast of the Sea of Okhotsk to the gold deposits areas. “Dalstroy” was turned into one of the biggest economic organization of the USSR, carrying out tasks related to the industrial development of the Kolyma region. For many years, prisoners became the main labor force used here. Hundreds of thousands of victims of political repression of the 1930-1950-s went their way from Nagaevsky port to the farthest mines and villages. 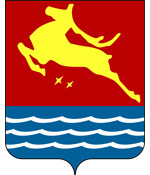 In 1953, the Magadan region was established on the territory of “Dalstroy”. 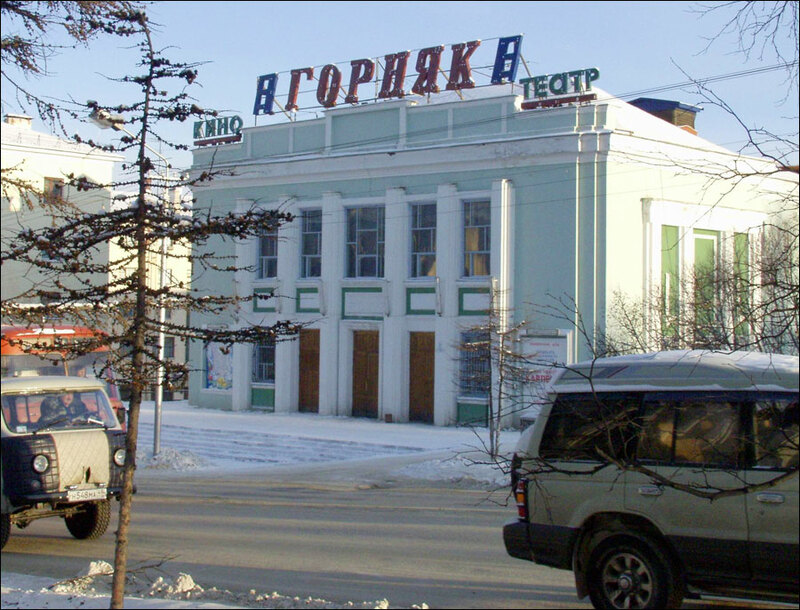 Magadan became its administrative, economic, scientific, and cultural center. 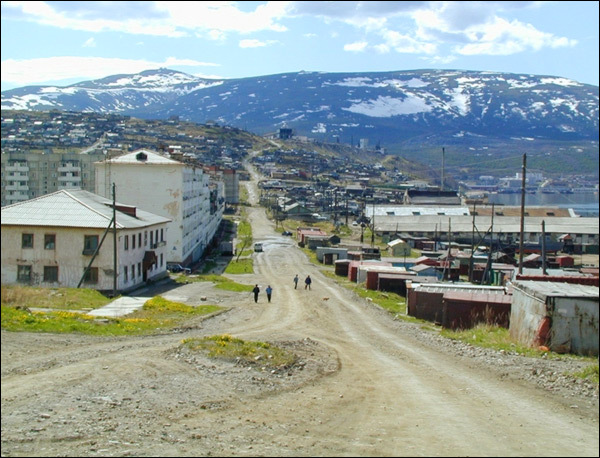 In 1960-1980-s, Magadan experienced a period of active construction. Magadanka River divides the city into two parts. The historic center of Magadan is formed by an ensemble of buildings constructed by the Leningrad architects in the neoclassical style in the 1950s. Magadan is situated in the subarctic climate zone. It is built on permafrost in the area of high seismicity. The city is located in an area with harsh climate, characterized by cold and snowy winters, short and often rainy summers (the period of “white nights” begins in June.). Spring comes in April, and winter - in October. The average temperature in January is minus 15.3 degrees Celsius, in July - plus 12.8 degrees Celsius. Yakutsk, the nearest city, is located about 2,000 km (1,200 mi) from Magadan. The federal highway R504 “Kolyma” connects the region with Yakutia and the other cities of Russia. The distance from Magadan to Moscow by roads is about 9700 km. There is no railway connection with other cities. Magadan Commercial Sea Port has an international status, and provides services in the mode of year-round navigation. International Airport “Magadan” (Sokol) is the largest airport in the north-east of Russia. It is almost the only way to transport people and emergency supplies. 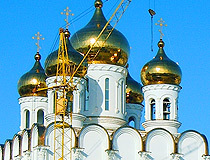 The airport provides regular flights to Moscow, Anadyr, Vladivostok, Khabarovsk, Irkutsk, Yakutsk, Novosibirsk, Petropavlovsk-Kamchatsky. The second airport (Magadan-13) lost its importance in 1990-2000s, and is used for a small number of charter flights now. The main industries of the city are fishing, gold mining, and ship building. The development of the territory is based on the extraction of mineral resources - gold, silver, tin, hydrocarbons, copper, molybdenum, etc. There are also large reserves of hard and brown coal, various building materials, volcanic ash, zeolites, mineral springs. The largest amount of gold is mined in this region of Russia. 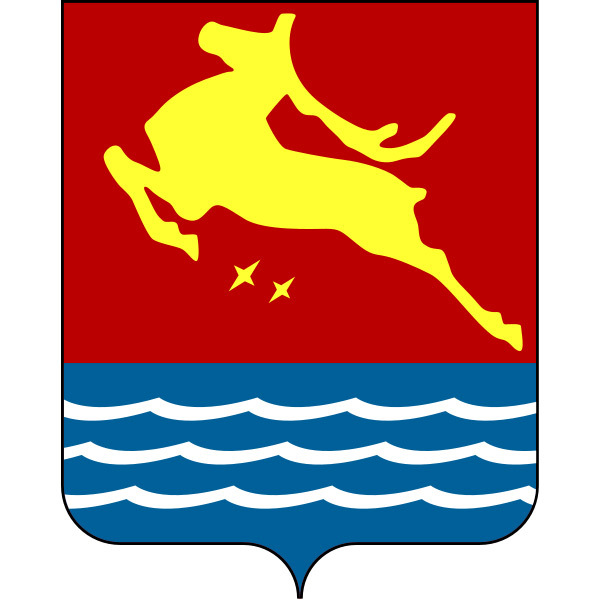 Golden deer on the emblem of Magadan embodies the two main branches of the economy of the region - mining of gold and reindeer husbandry. Magadan has the North-East Scientific Center of the Far Eastern Branch of the Russian Academy of Sciences. “Kamenny Venets” (“Stone Crown”). It is a natural monument, which is very popular among locals and visitors of the city. You can see this group of rocks, resembling a crown, over the Nagaev Bay. Magadan City Park. The first park in Kolyma was opened in 1935. Today, this park with a lot of attractions is also used to hold public events and celebrations. There are playgrounds for mini football, volleyball, two children’s playgrounds, two stages (upper and lower), etc. The total area of the park is about eight hectares. The monument “Uzel Pamyati” (“Memory Knot”). It is a monument to Magadan residents - the heroes of the Second World War. The monument “Mask of Sorrow”. It is a memorial to victims of political repression sent to the forced labor camps in Kolyma. The monument, located on Krutaya hill, was opened in 1996. 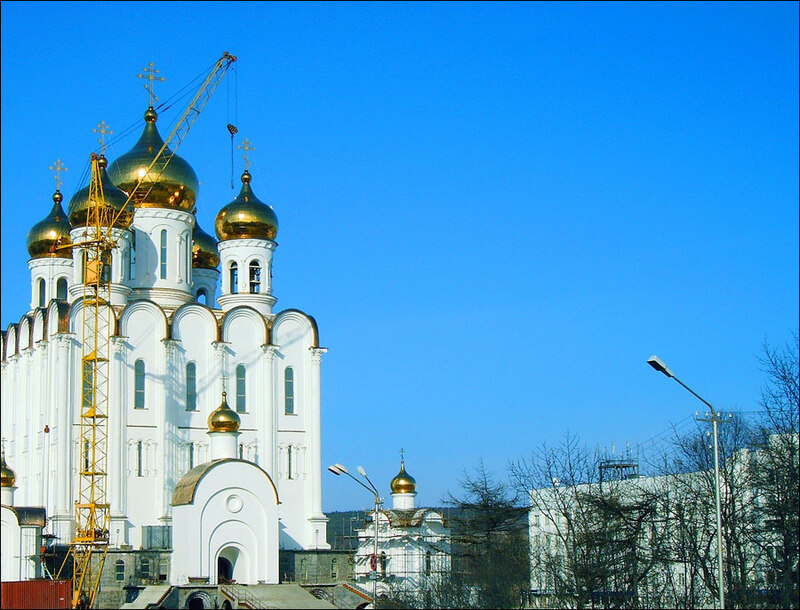 Holy Trinity Cathedral is a church-monument to victims of political repression. Apartment-Museum of V.A. Kozin (Shkolnyy Lane, 1). 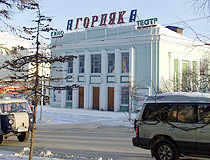 Magadan Regional Philharmonic (Karl Marx Street, 35). Andrew asks: What is the driving distance from Magadan and Anadyr? At the moment, there is no road between Magadan and Anadyr. But there is a project of this road and this work has already begun but it will take years to finish it. Sofia asks: I am interested in information about Magadan drama theatre. Would you please tell me about it and its history? I have found a couple of articles about the history of this theater (first, second). Also here is the official site of the theater. You can use this service to translate the sites from Russian. My two years teaching and working in the hospital with Dr Peter and others from 93-95 remains a fond memory. Would love to hear from any of you.